Nothing says “Be My Valentine” better than homemade chocolate covered strawberries! 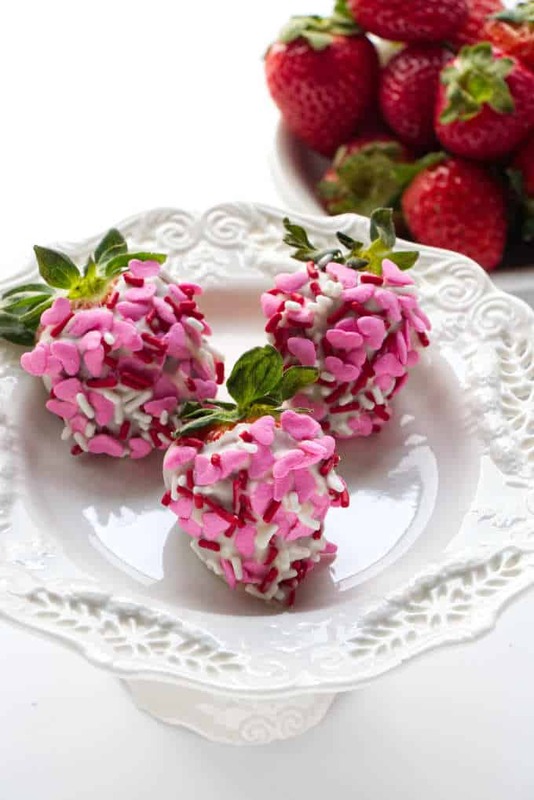 Show that someone special how much you care by giving them these hand-dipped strawberries. You can roll them in fancy sprinkles or chopped nuts for a spectacular presentation. 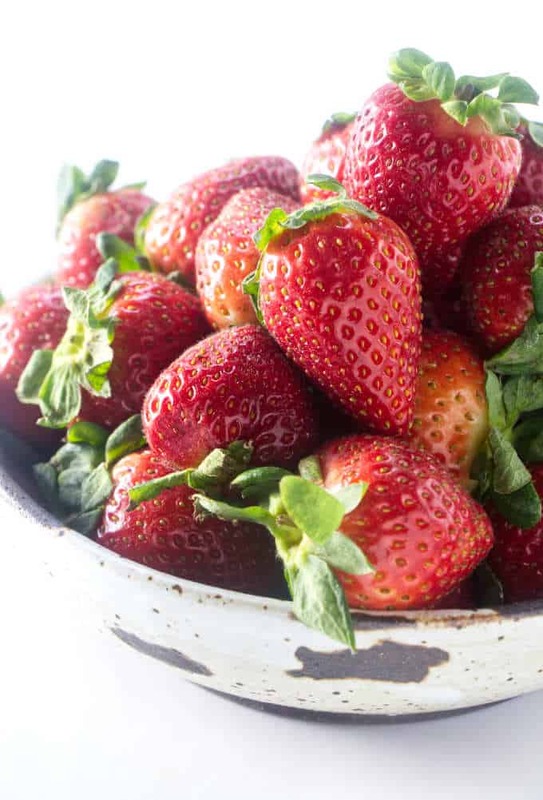 Grab some juicy red strawberries that still have the green leaves intact. If you happen to be lucky enough to pick them fresh from the strawberry fields then keep some of the stems intact too. Rinse the strawberries off and let them dry completely. Don’t even let a single drop of water remain on the strawberries. Water and chocolate do not mix and if a drop of water gets into the melted chocolate, the chocolate will seize up and get hard. Choose some good chocolate. Chocolate chips won’t cut it here. You actually can use chocolate chips but the chocolate chips will have a thicker consistency and will not coat the strawberries as smoothly and easily. Chocolate chips are specifically made to keep their little chip shape when they get hot. They are great in chocolate chip cookies, brownies, and cakes when you want those little cone-shaped bits of chocolate to keep their shape. But chocolate chips don’t make the best melting chocolate. I will let you in on a little secret though. If all you have are chocolate chips and that’s what you want to use then add 1/2 teaspoon of butter to the chocolate chips when you melt them. The butter will help smooth out the melted chocolate and make it easier to dip the strawberries. It will also make the chocolate a tad softer when it sets up and they won’t last as long outside of the fridge. What is good melting chocolate? Premium chocolate with a higher percentage of cocoa butter is called couverture chocolate. Couverture chocolate melts smooth and coats beautifully. It is also a bit more expensive. However, good melting chocolate doesn’t have to be expensive. You can use your favorite candy bar. We used the cheapest candy bar we could find in the grocery store and it worked just as well as the most expensive ones with higher amounts of cocoa butter. Hershey’s Special Dark worked just as well as the Lindt dark chocolate bar. Baker’s White Chocolate Baking bar worked just as well as Ghirardelli and Hershey’s milk chocolate bar worked just as well as Green & Black’s organic milk chocolate. The key to melting chocolate is to use LOW HEAT. The two easiest ways to melt chocolate are to either use a double boiler on the stove-top or melt intermittently in the microwave. If you want to melt the chocolate in a double boiler, bring a pot of water to a gentle simmer then reduce the heat so the water is just steaming. Place the chopped chocolate in a heat-proof bowl and set the bowl on top of the pot of hot water. The bowl shouldn’t touch the water in the pot. You are going to use the steam to gently heat the chocolate and melt it slowly. Stir it until all the chunks are melted and smooth. Microwaves can ruin melted chocolate in a heart beat if you try to rush things. Use the low setting, or the defrost setting if you don’t have a low setting on your microwave. Start by heating the chopped chocolate for about 45 seconds on a low setting and then stir it. It won’t look melted at first. But trust me, the chocolate is starting to soften. After the first blast in the microwave, repeat several more short bursts in 15-second intervals. You can let the chocolate sit in the closed microwave for 15 to 20 seconds after each burst. That way the residual heat will continue to SLOWLY melt the chocolate and you will have less chance of over-heating it. This little trick is especially helpful for white chocolate. White chocolate is easier to over-heat than dark or milk chocolates so just take your time. When the chocolate is 3/4 melted, just let it sit while the residual heat melts it the rest of the way. 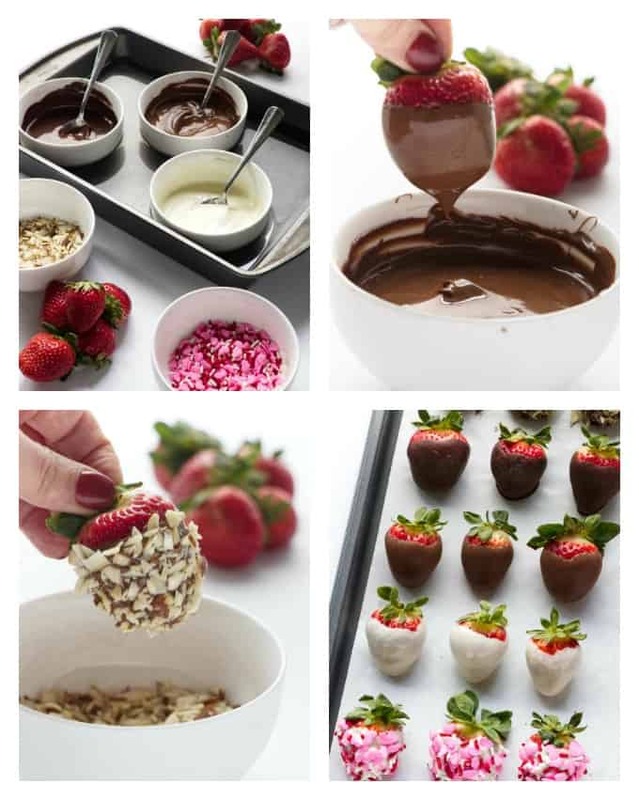 Once the chocolate is melted you want it to stay that way while you dip all your strawberries. You can either work quickly and dip all the berries as soon as the chocolate is melted, or you can keep the bowls warm and the chocolate melted while you work slowly. I tend to get pulled in different directions as I multi-task in the kitchen so I like to make sure the chocolate stays melted for a long time. To do this, place the bowls of melted chocolate in a large pan then pour hot water in the pan until it reaches about halfway up the bowls of chocolate. Make sure you don’t get any water inside the bowls of chocolate though. The water doesn’t have to be boiling. It just has to feel like a nice warm bath. 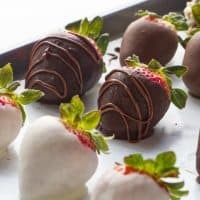 This will keep the chocolate melted a bit longer and give you more time to dip the strawberries and make perfect chocolate covered strawberries. 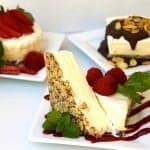 Here are a few more recipes that will make anyone feel special on Valentine's Day. 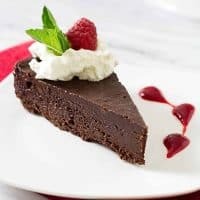 This flourless chocolate cake only has three ingredients and it tastes indescribably AMAAAZING!! Sweet strawberries and tart rhubarb make an incredible combination. 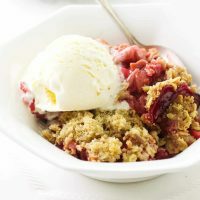 This strawberry rhubarb crisp is fast and easy to make. 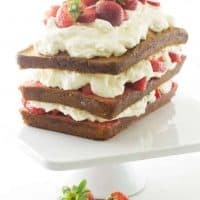 Strawberry shortcake is such a classic dessert that everyone loves. This recipe turns a basic pound cake into a masterpiece. 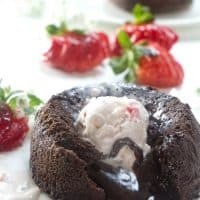 These little chocolate lava cakes are perfect for any time of the year but we think you NEED them on Valentines Day. 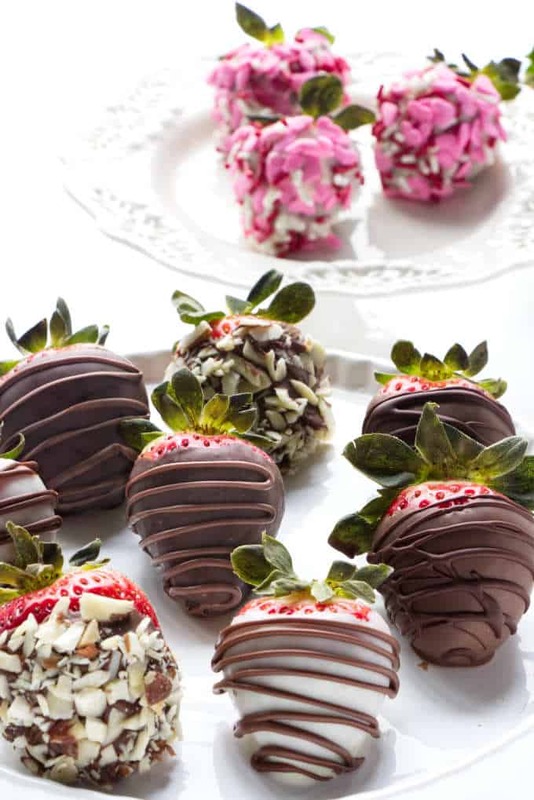 Have you made chocolate covered strawberries? We would love to hear from you. Drop us a comment below. Dip strawberries in dark, milk, and white chocolate then decorate them with chocolate drizzle or sprinkles and chopped nuts. After washing the strawberries, make sure they are completely dry. Line a sheet pan with wax paper or parchment paper. Place the dark, milk, and white chocolate in separate bowls. Melt the chocolate in the microwave in 20 to 30 second intervals or use a double boiler. Don't rush the process, chocolate doesn't need a lot of heat to melt. Place the bowls of melted chocolate in a larger pan and pour warm water in the pan until it comes half way up the bowls. Do not let any water get inside the chocolate. This will keep the chocolate warm and melted while you work with the strawberries. Hold the strawberries by the stem and dip them about 3/4 of the way into the chocolate. 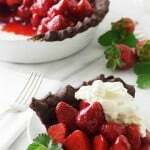 Gently shake the excess chocolate off and then place the strawberries on the wax paper. For any strawberries that you want to coat in sprinkles, roll them in the sprinkles after you dip them in the chocolate then place them on the wax paper. 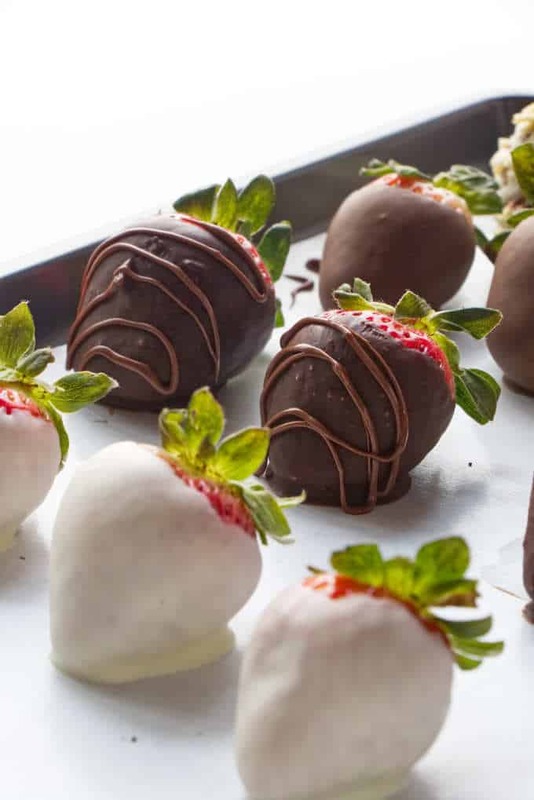 After all the berries have been dipped in chocolate, place them in the fridge for about 15 minutes to firm up. Place any remaining melted chocolate in a ziplock bag and cut a small snip in the corner of the bag. Drizzle the chocolate over the coated strawberries then place them back in the fridge for another 15 minutes until set. For best results, use chocolate candy bars instead of chocolate chips. Chocolate chips have additives that help the chips keep their shape when they are melted so they do not melt as smoothly as a candy bar. I haven’t made these in ages! And I got Mrs KR to melt the chocolate when I did — she’s a whiz when it comes to anything chocolate or baking related. And I agree that some of the cheaper brands of chocolate have really good flavor, particularly in this dish. 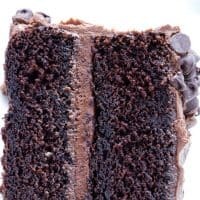 Terrific recipe and tips — thanks.